Combine morsels in small bowl, set aside. Combine flour, baking soda and salt in another small bowl. Beat butter, peanut butter, granulated sugar, brown sugar and vanilla extract in large mixer bowl until creamy. Beat in egg. Gradually beat in flour mixture. Stir in 1 cup morsel mixture. Drop dough by rounded tablespoon onto ungreased baking sheets. Press down slightly. Bake for 10 to 13 minutes or until golden brown. Cool on baking sheets on wire racks for 2 minutes; remove to wire racks to cool completely. 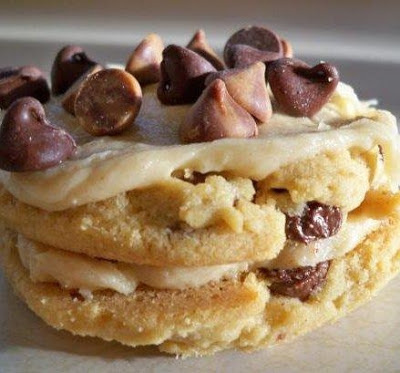 Spread Peanut Butter Frosting and Filling on bottom side of one cookie. Place bottom side of a second cookie over frosting creating a cookie sandwich; press down slightly. Frost top of cookie sandwich and sprinkle with a few morsels. Repeat with remaining cookies and frosting. PEANUT BUTTER FROSTING AND FILLING:. Combine 1 1/4 cups prepared vanilla frosting and 1/4 cup creamy or chunky peanut butter in small bowl.